Tony Pulis says he will never better the job he did at Crystal Palace, as the West Brom boss prepares to face his former side on Saturday. But the ex-Eagles manager still refuses to reveal his reasons for leaving two days before the start of this campaign. Pulis took over when Palace were second bottom in November 2013 and guided them to an 11th-place Premier League finish. "As a short-term position I don't think I'd ever better what went on at Palace," said the Welshman, 57. Palace had just seven points from 12 games when Pulis succeeded Ian Holloway at Selhurst Park, and his achievement in retaining the Eagles' top-flight status earned him the Premier League manager of the season award. 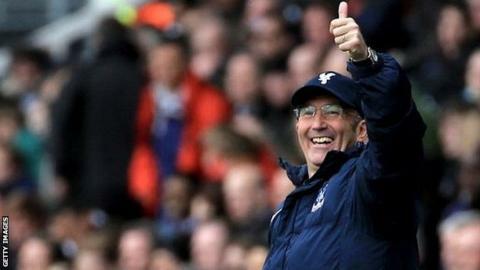 Pulis was unhappy when questioned on Friday about his sudden departure from Palace. "I don't want to talk about what went on and what didn't go on, what matters was them staying in the Premier League," he said. "It's a good club and has unbelievable potential. "To finish 11th was absolutely fabulous and something everyone at the club could be proud of." West Brom go into Saturday's match in 14th place, seven points above the Premier League relegation places with six games of the season remaining. Crystal Palace are just three places above them, but nine points better off. Current manager Alan Pardew has revitalised the Eagles, having helped the south London club to eight wins in 12 Premier League matches since taking over from Neil Warnock on 2 January.